At this morning's circus in the Senate Judiciary Committee -- during which Democratic members launched dozens of interruptions, and a seemingly endless string of shrieking left-wing protesters were dragged out of the room -- the opposition focused the bulk of their complaints on documents being withheld from the committee (here's some useful context on that). Some of their points actually seemed relatively fair and reasonable, and I think the administration erred by dropping thousands of previously-unseen documents the day before the hearings began. Other objections seemed more contrived and cynical. What was particularly difficult to take seriously were supposedly good-faith demands for more time and more documents, offered by Senators who've already stated their opposition to the nomination of Brett Kavanaugh. The three members who led the charge with the most interruptions (two of whom just happen to be presidential aspirants) were Cory Booker of New Jersey, Kamala Harris of California, and Richard Blumenthal of Connecticut, who repeatedly lied about serving in Vietnam. Were any of these three genuinely interested in reviewing additional materials, in order to learn more about the nominee and his record? Their own public statements suggest not. 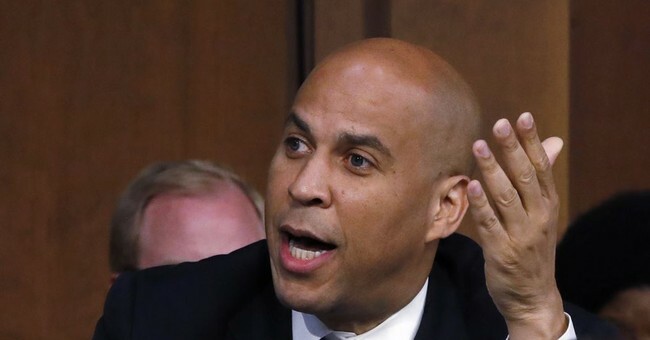 (1) Booker at the Kavanaugh hearing: We just need more time to carefully consider this nomination. What’s the Rush? Sen. Harris, for her part, was opposed to the Kavanaugh nomination before it was announced (as was another of her colleagues who interrupted today's hearings with gripes about procedure). After Justice Kennedy announced his retirement, Harris proclaimed that with another Trump appointee on the Court, "we're looking at the destruction of the constitution." In her own early July press release -- again, issued prior to any of the issues presently being cited as the basis for procedural complaints -- she wrote that "Judge Brett Kavanaugh represents a direct and fundamental threat to [America's] promise of equality and so I will oppose his nomination to the Supreme Court.” And Sen. Blumenthal, who mounted what appeared to be a calm and collected appeal for additional time and more files in order to facilitate a more "deliberative" and "thoughtful" assessment, also announced his verdict nearly two months ago: "Judge Kavanaugh, you don’t belong in this building as a justice. Judge Kavanaugh, you should not be serving in this building as a Supreme Court justice," he intoned at a partisan rally. And lest anyone missed his meaning, Blumenthal was also quoted as saying, "I will be a 'no' on this nominee." In this case, he's almost certainly telling the truth, very much unlike his numerous shameless lies about his own military service. Brett #Kavanaugh spent 12 years on the second-most influential court in the US, writing ~300 opinions--13 of which #SCOTUS adopted & only one reversed--all in his own name. The allegation there is not sufficient evidence for the Senate to advise on his nomination is nonsense.